The Asia-Pacific region is characterized by its tropical and subtropical humid climate, which is suitable for rice paddy cultivation and mold growth. The consumption of rice as a staple food, and the high population density which limits animal husbandry practices in that Region, has resulted in a typical food processing technology - cereal fermentation with molds. Molds and other microorganisms convert unpalatable carbohydrates of low digestibility and proteins into palatable sugars and amino acids respectively, with a high conversion efficiency. The soybean protein conversion ratio into amino acids in a traditional Korean soysauce fermentation for example, is over 75%, which is approximately 15 times higher than the feed protein conversion ratio in beef production, and 6 times higher than that in pork production (Lee and Jul, 1982). Cereal consumption in the Asia-Pacific region varies in accordance with geographic and climatic conditions. Inhabitants of the tropical Southeastern regions consume primarily rice, while those in subtropical and temperate zones of the Northeastern region including Northern China, Korea and Japan consume wheat, buckwheat, barley, corn, millet and soybeans in addition to rice. Table 1 shows the contribution of cereals to the diet in the Asia-Pacific region in 1995. Countries of the Mecong delta basin, known as the origin of fish fermentation technology derive up to 80% of their total caloric intake from rice. The correlation between rice eating habits and fish sauce consumption was discussed by Ishige (1993). On the other hand, countries of the Far East, China, Korea and Japan, known as the soybean sauce culture zone, consume less rice than countries of Southeastern Asia. Inhabitants of that region typically consume short grain rice (Japonica type). Rice consumption in this region has decreased owing to recent economic growth. According to statistical data, 47% of the total caloric intake in Korea and 43% in Japan were supplied by rice in 1965. These percentages decreased to 35% and 23% respectively in 1995, due to incorporation of other foods in the diet. In China on the other hand, wheat and shorgum are mostly consumed. India has cereal consumption patterns which are similar to those of China, but with the consumption of much less meat. These differences in cereal consumption patterns have resulted in variations in cereal fermentation practices in countries of the Asia-Pacific region. Source: Min, S.K. and Morashima, M. (1997). It is often mentioned that today's modern biotechnology originated from the alcohol fermentation of primitive man. Since indigenous fermented foods were produced by natural fermentation, the origin of cereal fermentation technology is obscure. Unlike fruit and milk fermentations, cereal fermentation requires a saccharification process, which is accomplished with some difficulty. One primitive method of cereal saccharification would be chewing raw cereals and spitting them into a vessel in order to allow saccharification to occur through the action of salivary amylase, followed by alcoholic fermentation by natural yeasts. Another method of cereal saccharification is through the malting process. Malting occurs naturally through wet damage of cereals during storage, and is used for beer making in Europe. However, in Asia the malting process is rarely used in traditional fermentation processes. Instead, fermentation starters prepared from the growth of molds on raw or cooked cereals is more commonly practiced. The use of fermentation starters might very well have its origins in the process of Euchok, the daughter of the legendary king of Woo of B.C. 4,000, known as the Godess of rice-wine in Chinese culture (Lee, 1984). Fermentation starters are referred to as chu in Chinese, nuruk in Korean, koji in Japanese, ragi in Southeast Asian countries and bakhar ranu or marchaar (murcha) in India (Batra and Millner, 1974). The first documentation of chu was found in Shu-Ching written in the Chou dynasty (1121-256 BC), in which it is stated that chu is essential for making alcoholic beverages. It is speculated that man must have discovered chu much earlier than was documented in the literature (Yokotsuka, 1985). According to Chi-Min-Yao-Shu written by Jia-Si-Xie of Late-Wei kingdom in the 6th century, dozens of preparation methods for chu, the cereal fermentation starter, were described (Yoon, 1993). Methodology for chu preparation is very similar to that for shi, or Korean meju, preparation, which is a moldy starter prepared from soybeans, for soysauce fermentation. The use of chu for rice-wine making was commonly practiced in the Spring and Fall and Warrior Periods of China (BC 7-3 centuries) and the beginning of the Three Nation's Periods in Korea (BC 1 - AD 2 centuries). This process must have been transferred from Korea to Japan in the 3rd century by Inborn, according to Kojiki, or Chin, whose memorial tablet is kept in a shrine, Matsuo Taisha, in Kyoto, Japan (Lee, 1995). In the indigenous process of rice-wine making, saccharification, souring and alcoholic fermentation proceed almost simultaneously. Lactic acid fermentation of cereals is, therefore, an old process in East Asia, which occurs naturally in rice-wine fermentation, but has limited application in other food processing when compared to lactic fermentations practiced in Europe and Africa (Lee, 1994). Sour bread prepared from rice can be found in some areas of the Asia-Pacific region, but is most commonly produced in the Philippines. Lactic acid fermentation of cereals has been used more significantly as a preservative in fish fermentations. Historically, lactic fermentation of fish was associated with salt production, irrigated rice cultivation and the seasonal behavior of fish stock. The Mekong basin was most probably the place of origin of these products, and Han Chinese (BC 200-AD 200) learned of it when they expanded south of the Yangtze river. Fish products prepared by lactic acid fermentation remain common in Laos, Kampuchea, and in the north and the north-east of Thailand (Ishige, 1993). When considering the historical background and the technical aspects of cereal fermentations in the Asia-Pacific region, fermentation starters prepared from cereals should be discussed prior to the products of fermentation. As mentioned above, chu is commonly used in the Asia-Pacific region as an enzyme source for the degradation of complex plant tissue to produce cereal-wines, soysauce, fish and meat sauce, sour bread, and fermented porridges and snacks. Table 2 summarizes the names of chu in different countries, and their ingredients. According to Chi-Min-Yao-Shu (AD 530-550), chu was prepared from barley, rice and wheat, and can be classified as described in Figure 1 (Yoon, 1993). Ten different types of chu were described in Chi-Min-Yao -Su, all of which were used for the fermentation of alcoholic beverages. Granular types were used for soysauce and soybean paste fermentation. Figure 1. Classification of fermentation starters described in Chi-Min-Yao-Shu. Cake type ping-chu is identical to nuruk in Korea, and granular type san-chu is similar to Japanese koji. Since cake type ping-chu was described in Chi-Min-Yao-Su written in AD 530-550, it should be corrected that cake type ping-chu was developed later in the Han dynasty (AD 947-979) as reported by Yokotsuka (1985). Figure 2 outlines the processing methodology for the production of shen-chu from barley and chun-jiu-chu from wheat as described in Chi-Min-Yao-Shu. According to the book, the appropriate season for the preparation of chu is July in which the ambient temperature is between 20oC - 30oC in Northern China and the Korean peninsular. The procedures for preparing these starters are very similar to those for the preparation of nuruk in Korea. According to Yokotsuka (1985), chu may either be yellow (huang) possibly due to Aspergillus oryzae, or white probably due to Rhizopus and Mucor. Huang-chu was widely used for alcoholic fermentation as well as for the fermentation of soybean foods. Three types of huang-chu have been described, huang-yi, huang-tcheng and nu-chu. Huang-yi is prepared from crushed wheat, which is washed, soaked in water until sour and then drained and steamed. After cooling, the steamed wheat is piled to a thickness of 6 cm and covered with leaves for 7 days following which it is covered with yellow mycelia and spores. Chu thus prepared is then sun dried. During the preparation of huang-tcheng, wheat flour mixed with water is shaped into a ball or cake, which is steamed, cooled, and then covered with leaves until it develops cultures of molds. Nu-chu is prepared from cooked rice, which is shaped into a cake and then cultured with molds (Yokotsuka, 1985). Wheat chu originated in the Northern part of China and the Korean Peninsular, while rice chu originated in the South. This is reflected by the main ingredients of the fermentation starters prepared today in the countries of the South-Pacific region as shown in Table 2. Figure 3 compares the preparation processes of Korean nuruk, Japanese koji, Indonesian ragi, and Philippine bubod (Steinkraus, 1983). Nuruk, ragi and bubod are similar in that they are prepared by the natural fermentation of raw cereal powders which are molded into the shape of a cake or ball. Koji on the other hand is prepared by controlled fermentation of cooked cereals in a granular form, which are commonly inoculated with the mold, Aspergillus oryzae. Numerous types of microorganisms, molds, bacteria and yeasts, are found in these naturally fermented products. Aspergillus oryzae (1x107 cfu/g), Aspergillus niger (1x107 cfu/g), Rhizopus (1x106 cfu/g), bacteria (1x107 cfu/g) and yeasts (1x105 cfu/g) were identified in nuruk (Kim 1968). The number of molds (1x103-107/g), yeasts (1x105-107/g) and lactic acid bacteria (1X105-107/g) were observed to vary with the source and district of collection of bubod (Tanimura et al., 1978). Important microorganisms in ragi fermentations were molds of Amylomyces rouxii and yeasts of Endomycopsis burtonii (Ko, 1972), while those in loog-pang were Amylomyces, Aspergillus, Rhizopus, Mucor, and Absidia (Pichyangkura and Kulprecha, 1977). Table 3 compares the enzyme activities of Japanese koji and Korean nuruk (Nunokawa and Ouchi 1973, Kim 1968). Enzyme activities in koji are generally higher than those in nuruk. This may be due to the fact that the pure culture of Aspergillus oryzae on loose cereal granules allows maximum growth during the preparation of koji, while in nuruk manufacture, mold growth is confined mainly to the surface of the cake or ball, thus allowing yeasts and lactic acid bacteria to grow simultaneously, and contribute to the deeper flavor notes of Korean rice-wine in later alcoholic fermentation stages. Of 41 yeast strains isolated from Indonesian ragi and tape by Saono and co-workers (1977) 19 were amylolytic, none were proteolytic, but 14 were lipolytic. All mold isolates were amylolytic and lipolytic, and 89% also exhibited proteolytic activity. Figure 4 outlines the preparation of solid-state fermented starters used for the preparation of soysauce in Korea and Japan. Korean meju is prepared from cooked whole soybeans, while Japanese koji is prepared from a mixture of roasted wheat and defatted soybean cake. Koji is prepared by the inoculation of Aspergillus oryzae in a controlled fermentation, while meju is prepared by spontaneous fermentation. The outer layer of the meju ball is over grown with molds, while on the inside, bacteria, mainly Bacillus subtilis grow. Figure 4. Flow chart for the preparation of solid-state fermented starters used in soysauce processing (Saone et al., 1986 ; Lee and Jul, 1982). Indigenous fermented foods may be classified according to a number of different criteria. They may be classified in accordance with the raw materials used, the major type of fermentation taking place, the usage of the product, and the district of production. In general, fermented products are classified according to usage of the products and the major fermentation process taking place; e.g. alcoholic foods and beverages, vinegars, breads, fermented porridges and snacks, and lactic acid fermented fish products. The type of cereals used in the fermentation process and the regional variation of the fermentation form the sub-classes of each category. Numerous types of fermented products prepared using various methodologies and having different physico-chemical and sensory characteristics within each category are described in the literature. More than 200 alcoholic beverages are described in Korean literature written between the 17th and 19th centuries. Some of these beverages are identical but differ in nomenclature; however, most of the products vary according to the methods of preparation, raw materials used and the season of production. Traditional Korean alcoholic beverages are classified in Table 4 (Lee and Kim, 1993). The term rice-wine (chongju or yakju) designates a filtered clear beverage containing an alcohol content of at least 15%, while rice-beer (takju) designates an unfiltered turbid beverage containing approximately 8% alcohol. These designations are applicable to most of the indigenous alcoholic beverages of the different countries described in this Chapter. The terminology describing alcoholic beverages in individual countries is generic, and represents numerous varieties of a single product in a country. Methods of producing alcoholic beverages, and their microbial and biochemical characteristics are also described here. The most important fermentation products of cereals in the Asia-Pacific region are acids and alcohols, which are both flavor compounds and food preservatives. Alcohol fermentation is more important than acid fermentation in this region in terms of the relative amounts of cereals used for fermentation and the varieties of the products produced. Alcoholic fermentation of cereals also involves acid fermentation, which prevents the growth of spoilage and pathogenic microorganisms at the initial stage of the fermentation, but causes quality deterioration during storage. Alcoholic beverages have played an important role in human spiritual and cultural life both in Eastern and Western societies. Unlike in Europe and the Middle East, where indigenous alcoholic beverages are produced primarily from fruit, alcoholic beverages are produced from cereals in the Asia-Pacific region, and serve as an important source of nutrients. European beer uses barley malt as the primary raw material, while Asian beer utilizes rice with molded starters as the raw material. Beverages vary from crystal-clear products to turbid thick gruels and pastes. 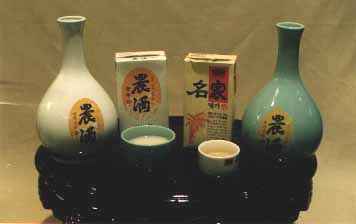 Clear products which are generally referred to as shaosingjiu in China, chongju in Korea and sake in Japan, contain at least 15% alcohol and are designated as rice-wine, while turbid beverages, such as takju in Korea and tapuy in the Philippines which contain less than 8% alcohol along with suspended insoluble solids and live yeasts, are referred to as rice-beer. Examples of alcoholic beverages prepared from cereals in Asia-Pacific region are listed in Table 5. The process of cereal alcohol fermentation using mould starters was well established in the year of 1000 BC, and 43 different types of cereal wines and beers were described with detailed processing procedures in Chi-Min -Yao-Su (AD 530-550). Millet appeared to be the main ingredient for alcohol fermentation. Among the 43 product types described, 16 were prepared from millet, 11 from rice and 12 from Indian millet. The dried and powdered starter was mixed with water and steamed grains, and fermented for 2-3 weeks or up to 5-7 months depending on the brewing method. Multiple brews prepared by adding newly cooked grains to the fermenting mash for 2, 3, 4 and up to nine times were described (Yoon, 1993). Figure 5 compares the processing methodology for the preparation of quing-chu-jiu as appeared in Chi-Min-Yao-Su with that for traditional chong-ju prepared in Korea. The incubation period for each step of the brewing process varies from 2 days to one month depending on the fermentation temperature. Low temperatures (ca. 10oC) are better for improving taste and keeping quality of the wine. Wines are traditionally prepared in late autumn or early spring, when ambient temperatures are below 10oC in the Far Eastern region. The volume of wine produced is approximately the same as that of raw grain used (Lee and Kim, 1993). The traditional method of rice-wine brewing was industrialized by Japanese brewers in the late 19th century, who adopted pure starter culture manufacturing technology from Europe and transferred it to Korea and China. Figure 6 shows the Japanese process for preparing rice-wine (Steinkraus, 1983). Figure 5. Flow chart for the production of rice-wines in China and Korea. Figure 6. Flow chart for the Japanese Sake brewing process. Cereal beers are produced at a higher fermentation temperature, (ca. 20oC) than are cereal wine, and are usually prepared by either single or double brewing. The fermentation starter powder is mixed with cooked cereals incubated at approximately 20oC for 2-3 days, following which it is filtered through a fine mesh, sieve or cloth. Figure 7 compares the preparation of Korean takju with that of Philippine tapuy (Steinkraus, 1983). Similar products such as brem bali in Indonesia (Saono et al., 1986) and jaanr and bhatte jaanr in Sikkim, India (Tamang et al., 1996; Batra and Millner, 1974) are also prepared in other Southeast Asian countries. Biochemical changes occurring during the fermentation of takju are summarised in Figure 8 (Kim, 1968). Cereal-beers are abundant in micro-nutrients, such as the B vitamins which are formed during the fermentation. Table 5 shows the approximate chemical compositions of takju which contains 7% alcohol (Korea Rural Nutrition Institute, 1991). Indonesian brem bali contains 16-23 % reducing sugars and 6-14% ethanol (Saono et al., 1986). Figure 7. Flow chart for the processing of takju and tapuy. In the Southeast Asian countries, alcoholic fermentation has been used for the preparation of paste-type food products. Figure 9 outlines the processing procedure for the manufacture of tape ketan in Indonesia (Saono et al., 1986) and bhattejaanr in East Sikkim, India (Tamang et al., 1996). The major contributing microorganisms for tape ketan fermentation are Amylomyces rouxii and Endomycopsis burtonii. Figure 10 shows that during the course of fermentation, the pH decreases to 4.0 and ethanol content increases to 7% within 48-72 hrs of fermentation, while starch and reducing sugars are decreased (Steinkraus, 1983). Mirin is a traditional Japanese alcoholic seasoning prepared, from rice and koji. The digestion of rice by native enzymes in koji is carried out in ethanol in order to prevent microbial contamination. Mirin, the final product, is a clear liquid containing approximately 40% sugar, which is produced as a result of starch hydrolysis by koji enzymes. Approximately 80% of the sugar content of mirin is glucose (Takayama et al., 1997). (Saono et al., 1986; Tamang et al, 1996). Vinegar production is as ancient as is alcoholic fermentation, since acetic acid is produced in any natural alcoholic fermentation upon exposure to the air. In the Asia-Pacific region, vinegar prepared from cereal alcoholic fermentations is widely used in Northeastern Regions, while vinegars from tropical fruits, such as coconut, sugar cane and pineapple, are prepared in Southeastern countries (Saono et al., 1986). Cereal vinegars may be divided into three classes: rice vinegar, rice-wine filtercake vinegar and malt vinegar. Indigenous processes for the preparation of vinegars are natural or spontaneous fermentations brought about by the growth of Acetobacter on alcoholic substrates under aerobic conditions. Traditionally, degraded or poor quality rice-wines were used for the production of low-grade vinegars at the household level. Today, vinegars of high quality standards are produced by industry (Lim, 1984). Rice vinegar is prepared from polished, unpolished or broken rice. The fermentation starter, chu, nuruk or koji prepared from rice, is used for saccharification and alcohol fermentation as in the preparation of rice-wine. Slightly greater amounts of nuruk (ca. 30% of steamed rice) than are used in the preparation of rice wine are added to steamed rice, following which water is added (2-3 parts water : 1 part raw rice). Fresh vinegar containing the appropriate organism is added to the fermented mash at a level of 8-20% of the weight of raw rice, and incubated at 30-35oC for 1-3 months. An additional storage period of 2-3 months is required for production of a high quality aged product (Ha, 1986). Figure 11. Flow chart for the processing of rice-wine filtercake vinegar. Large quantities of acid leavened bread and pancakes are consumed daily in India, Sri Lanka, Pakistan, Nepal, Sikkim, Tibet and neighboring countries. Idli, dosa and dhokla are produced primarily in South India and Sri Lanka, and jalebies are consumed throughout India, Nepal and Pakistan. Idli is a small, white acid-leavened and steamed cake prepared by bacterial fermentation of a thick batter prepared from carefully washed rice and dehulled black gram dhal. The rice is coarsely ground and the black gram is finely ground. Dosa batter is very similar to idli batter, except that the rice and black gram are finely ground. Following fermentation, the dosa is quickly fried as a thin, fairly crisp pancake and eaten directly. Dhokla is similar to idli except that dehulled Bengal gram dhal is used instead of black gram dhal in its preparation. The fermented batter is poured into a greased pie pan, and steamed in the open rather than in a covered idli steamer. Fig 12 shows the flow chart for idli production (Steinkraus, 1983). During the production of these fermented breads, Leuconostoc mesenteroides and Streptococcus faecalis develop concomitantly at the soaking stage, and then continue to multiply following grinding (Mukherjee et al., 1965). L. mesenteroides is considered to be the microorganism essential for leavening of the batter and also responsible, along with S. faecalis, for acid production in idli, dosa and related products. These organisms appear to be associated with the ingredients and it is generally unnecessary to add an inoculum. Aerobic contaminants on the ingredients are eliminated partly by careful washing the ingredients and partly by acidic conditions generated during the fermentation. Batra and Millner (1974) isolated Torulopsis candida and Trichosporon pullulans from idli batter and prepared authentic idli using the combined action of both yeasts. Both T. pullulans and T. candida imparted characteristic acidity. In addition, T. candida produced gas. Jalebies are pretzel like, syrup-filled confections prepared from deep-fried, fermented wheat-flour dough. Saccharomyces bayanus Sacc. was isolated as a fermentor of wheat-flour paste during the preparation of jalebies. Jalebies prepared using that organism, could not be distinguished from a similar batch prepared using commercial bakers yeast as the fermentor. Acid-leavened bread and noodles prepared in the Asia-Pacific region are described in Table 7. Although yeast fermented breads are widely consumed in the Asia-Pacific Region, leavened bread type foods are not traditional staples of that region. Chinese have traditionally consumed steamed bread or mantou, which is prepared by steaming yeast-leavened wheat dough, often filled with sweets, meats and vegetables. Figure 12. Chart for traditional Indian idli production (Steinkraus, 1983). Other types of breads are prepared primarily by acid fermentation of rice flour dough. These include Korean kichudok and Philippine puto, as shown in Table 7. These products are leavened, steamed rice cakes which are similar to Indian idli, except for the fact that they do not contain any legumes. Puto is special in that it is prepared using year-old rice and the batter is neutralized at the mid point of the fermentation. Figure 13 outlines processing methodologies for the preparation of kichudok and puto. Kichudok is prepared at the household level in Korea and is consumed on special occassions, while puto is normally consumed as a breakfast and snack in the Philippines. Puto is a common food of the lower-income group, but puto varieties containing added cheese, eggs etc., are consumed as delicacies by higher-income groups. In a number of Philippine towns, the preparation of puto is an important cottage industry (Sanchez, 1977). Brem is a special snack food prepared by the acid fermentation of rice in Indonesia. It is a solid cake, with a sweet and slightly sour taste, containing over 65 % of glucose. Figure 14 shows essential steps in the processing of brem. Mungbean starch is produced in most Asian countries, and mungbean starch noodles are dietary staples of the Chinese. The process for manufacturing mungbean starch involves an acidic bacterial fermentation (Wang, 1977). The mungbeans are hydrated by soaking in water and inoculated with 12-hr steep water from a previous fermentation to insure acidification of the beans. The principal microorganisms found in the steep water are L. mesenteroides, L. casei, L. collobiosus and L. fermentum. Lactic fermentation which reduces the pH to about 4.0 protects the starch granules from spoilage and putrefaction that would occur in ground bean slurries. Thai rice-noodle, khanom-jeen, is also prepared from acid-fermented rice (Rosanaphaiboon, 1987). Soaked rice is drained and fermented for at least 3 days prior to grinding. Lactobacillus species and Streptococcus species are involved in the acid fermentation. Acid-fermented porridges, such as ogi and uji in African countries, are not common in the Asia-Pacific region. The storage life of perishable fish and meats can be extended by acid-fermentation with added carbohydrates and salts. Rice, millet, flour and even syrup or sugar are used as carbohydrate sources. A number of acid-fermented fish and meat products of different countries are listed in Table 8 (Lee, 1989). Acid fermentation and the keeping quality of the product are greatly influenced by the amoung of added salt and carbohydrate (Jamias-Apilado and Mabesa, 1990; Mabesa and Babaan, 1993). Figure 14 outlines processing methodologies for the production of Korean sikhae and Philippine balao-balao. Both fresh water and sea water fish are preserved using this method. Millet is used as the carbohydrate source in the Northeastern countries, while in the Southeastern countries, rice is commonly used as the carbohydrate source. Table 9. Examples of acid-fermented seafood, cereal, and meat mixtures. Figure 16 shows the microbial and biochemical changes of a typical lactic fermented fish product, sikhae, incubated at 20ºC. The pH decreases rapidly during the first 3-5 days from 6.5 to below 5.0, while the texture softens within 3-4 days. The amino-N concentration increases steadily for 14 days, coincident with the attainment of optimum flavor. The number of lipolytic bacteria decreases rapidly during the initial stages of fermentation, while proteolytic bacteria increase until the twelth day of fermentation and thereafter decrease rapidly. Acid forming bacteria increase rapidly, become the dominant microorganisms within one week of the fermentation and attain a maximum at 16 days. Flavor deterioration is associated with maximum growth of yeast and acid-forming bacteria (Lee et al., 1983). Important bacteria for the lactic fermentation of Sikhae were identified as Leuconostoc mesenteroides and Lactobacillus plantarum (Souane, 1987). The role of these acid forming bacteria for the preservation of fish is apparent, but a more important factor is their ability to produce acceptable flavor during the fermentation process. Fermented pork, nham, is a popular food in Thailand. It consists of fresh pork meat that is trimmed, minced, mixed thoroughly with salt, rice and seasoning and wrapped in small banana leaf packets. As is the case with Western fermented sausages, such as pepperoni and salami, Pediococci sp. (P. cerevisiae) are the main microorganisms associated with the fermentation. Lactobacillus plantarum and L. brevis have also been identified (Phithakpol, 1987). fermented fish product, sikhae (Lee, 1990). The production of rice-wine is a highly industrialized process in the Far-eastern countries. Numerous studies on koji molds, sake yeasts and lactic acid bacteria, and their interactions during rice-wine brewing have been conducted in Japan. The application of modern biotechnology, particularly the application of immobilized microorganisms to brewing, has been studied widely and has substantially improved the traditional process of rice wine making. The use of recombinant DNA strategies for strain development is a hot issue in this area of research. Recent advances in Japanese brewing technology are well documented by Inoue and colleagues (1992). Figure 17. Pasteurized and aseptically packaged Korean takju and chongju. Extension of the shelf-life of rice-beer is perhaps the most important problem to be solved in Asia. Recently, optimum pasteurization conditions for takju were established and commercially applied (Lee et al., 1991; Lee and Kim, 1995). Under these conditions, the flavour of takju is stable for six months, and pasteurized and aseptically packaged Korean takju is now exported to Japan and the USA (Figure 17). Research geared toward the development of high protein lactic acid beverages from cereals has been conducted by several laboratories in East Asian countries (Lee, 1992). Pre-fermentation and extrusion cooking are desirable for improving the acceptability and yield of lactic fermented rice beverages (Lee et al., 1992; Souane, 1994). The organic acid composition, particularly the ratio of acetic acid and lactic acid produced by specific heterofermentative lactic acid bacteria, is an important factor for the fresh fruity flavor of fermented rice beverages (Yi et al., 1993). Production of yogurt-like beverages from cereals, (e.g. risogurt) has been investigated on a laboratory scale as well as a pilot plant scale (Mok, 1994; Collado et al., 1994). Although consumer surveys revealed that the rice yogurts risogurt were highly acceptable, these products have not been commercialized. Batra, L. R. and Millner, P. D., 1974. Some Asian fermented foods and beverages and associated fungi. Mycologia, 66, 942-950. Collado, L.S., Mabesa, R.C., Sumague M.J.V. and Mok, C.K. 1994. Yogurt-like products from rice flour and soymilk. The Philippine Agriculturist, 77(3), 307. Ha, D.M. 1986. Fermentation Technology (Korean). MunwunDang, Seoul, p.414. Inoue, T., Tanaka J. and Mitsui, S. 1992. Recent Advances in Japanese Brewing Technology,Gordon and Breach Sci. Publ., Philadelphia, USA. Ishige, N. 1993. Cultural aspects of fermented fish products in Asia. In Fish fermentation technology, (eds.) Lee, C.H., Steinkraus, K.H. and Reilly, P.J.A., UNU Press, Tokyo, p.13-32. Jamias-Apilado, R.B. and Mabesa, R.C. 1990. Influence of rice and salt on the rate of rice-fish fermentation. The Philippine J. of Biotechnol., 1(2), 160. Jamias-Apilado, R.B. and Mabesa, R.C. 1991. Influence of commercial starter cultures on the rate and quality of rice-fish fermentation. The Philippine J. Biotecnol., 2(1), 60. Kim, C.J. 1968. Microbiological and enzymological studies on Takju brewing. J. Korean Agricul. Chem. Soc., 60. 69-99. Korea Rural Nutrition Institute. 1991. Food composition table. 4th edition, RDA, Seoul, Korea. Lee, C.H. 1989. Fish fermentation technology. Korean J. Appl. Microbiol. Bioeng., 17(6), 645. Lee, C. H. 1990. Fish fermentation technology-A review, Proceedings of the Workshop on Post-harvest Technology, Preservation and Quality of Fish in Southeast Asia. IFS, Sweden, 1-14. Lee, C.H. 1992. Industrialization of lactic acid fermentation technology of cereals and its dissemination to developing countries. In Proceedings of IDDA expert group meeting on applications of biotechnology to food processing in Africa, Ibadan, Nigeria, 16-20, December 1991, p.76. Lee, C.H. 1994. Importance of lactic acid bacteria in non-dairy food fermentation. In Lactic acid fermentation of non-dairy food and beverages, (eds.) C.H. Lee, J. Adler-Nissen and G.Barwald, HarnLimWon, Seoul, p.8-25. Lee, C.H. 1995. An introduction to Korean food culture. Korean and Korean American Studies Bulletin, 6(1), p.6-10. Lee, C.H. and Jul, M. 1982. The effect of Korean soysauce fermentation on the protein quality of soybean. In Traditional food fermentation as industrial resources in ASCA countries, (eds.) S. Saono, F.G. Winarno and D. Karjadi, LIPI, Jakarta, Indonesia, p.209-220. Lee, C.H. and Kim, G.M. 1993. Korean rice-wine, the types and processing methods in old Korean literature. Bioindustry, 6(4), p.8-25. Lee, C.H. and Kim, G.M. 1995. Determination of the shelf-life of pasteurized Korean rice wine, Yakju, in aseptic packaging. Korean J. Food Sci. Technol., 21(2), 156. Lee, C.H., Min, K.C., Souane, M., Chung, M.J., Mathiase, T.E. and Adler-Nissen, J. 1992. Fermentation of prefermented and extruded rice flour by the lactic acid bacteria from sikhae, Food Biotechnol., 6(3), 239. Lee, C.H., Cho, T.S., Lim, M.H., Kang, J.W. and Yang, H.C. 1983. Studies on the Sik-hae fermentation made by flat fish, Korean J. Appl. Microbiol. Bioeng., 11(1), 53. Lee, C.H., Tae, W.T., Kim, G.M. and Lee, H.D. 1991. Studies on the pasteurization conditions of Takju, Korean J. Food Sci. Technol., 44. Lim, O.K. 1984. Vinegar processing methods. Food Sci. (Korean) 17(1), 16-27. Min, S.K. and Morashima, M. 1997. Samsung Economics Research Institute, Seoul, p.156-241. Mok, C.K. 1994. Lactic acid fermentation if rice and its quality improvement strategy. In Lactic acid fermentation of non-dairy food and beverages. (eds.) C.H. Lee, J. Adler-Nissen and G. Barwald, HarnLimWon, Seoul, p.132. Mukherjee, S.K., Albury, M.N., Pederson, C.S., Van Veen, A.G. and Steinkraus, K.H., 1965. Role of Leuconostoc mesemteroides in leavening the batter of idle, a fermented food of India. Appl. Microbiol., 13, 227-231. Nunikawa, Y. and Ouchi, K. 1973. Kagaku to Seibutsu, 11, 216. Phithakpol, B. 1987. Traditional Thai fermented pork. In Traditional food and their processing in Asia. (eds.) F. Yanagida, Y. Takai, S. Homa, S. Kato and Y. Ando, NODAI Research Institute, Tokyo, p. 189. Pichyangkura, S. and Kulprecha, S. 1977. Survey of mycelial molds in loogpang from various sources in Thailand. Symposium on Indigenous Fermented Foods, Bangkok, Thailand. Rosanaphaiboon, T. 1987. Khanom-jeen. In Traditional food and their processing in Asia. (eds.) F. Yanagida, Y. Takai, S. Homa, S. Kato and Y. Ando, NODAI Research Institute,Tokyo, p.48. Sanchez, P.C. 1977. Puto - Philippine fermented rice cake. Symposium on indigenous fermented foods, Bankok, Thailand. Saono, S., Basyki, T. and Sastraatmadja, D.D. 1977. Indonesian ragi. Symposium on Indigenous Fermented Foods, Bangkok, Thailand. Saono, S., Hull, R.R. and Dhamcharee, B. 1986. A Concise Handbook of Indigenous Fermented Foods in the ASCA Countries, LIPI, Jakarta, Indonesia. Souane, M., Kim, Y.B. and Lee, C.H. 1987. Microbial characterization of Gajami-sikhae fermentation. Korean J. Appl. Microbial. Bioeng., 15(3), 150. Souane, M. and Lee, C.H. 1994. Production of high protein content lactic beverage from rice-soymilk mixture. In Lactic acid fermentation of non-dairy food and beverages. (eds.) C.H. Lee, J. Adler-Nissen and G. Barwald, HarnLimWon, Seoul, p.87. Takayama, T., Oyashiki, H. and Sakai, T. 1997. Immobilized glucose isomerase use in Mirin production. J. Food Sci., 62(2), 237. Tamang, J.P., Thapa, S., Tamang, N. and Rai, B. 1996. Indigenous fermented food beverages of Darjeeling Hills and Sikkim; Process and product characterization, J.of Hill Research, 9 (2) , 401-411. Tanimura, W., Sanches, P.C. and Kozaki, M. 1978. The fermented food in the Philippines (Part 1) Tapuy(Rice wine). J. Agric. Soc. (Japan), 22, 118-133. Wang, H.H. 1977. Use of acid fermentation in the production of mungbean starch. Symposium on Indigenous Fermented Foods. Bangkok, Thailand. Yi, D.Y., Kim, G.M., Lee, K.Y. and Lee, C.H. 1993. Organic acid composition and flavor characteristics of lactic acid fermented cereal beverages. J. Microbiol. Biotechnol., 3(2), 129. Yokotsuka, T. 1985. Fermented protein foods in the Orient, with emphasis on shoyu and miso in Japan. In Microbiology of fermented foods. vol.1, (ed.) B.B. Wood, Elsevier Appl. Sci., London, p. 197-247. Yoon, S.S. 1993. CheMinYoSul, A Translation of Chi-Min-Yao-Shu in Korean. MinEumSa,Seoul, Korea.